Dal or Dhal (IPA: ) is a dried pulse (lentil, pea or various types of bean) which has been split. The outer hull is usually stripped off; dal that has not been hulled is described as chilka (skin), e.g. chilka urad dal, mung dal chilka. 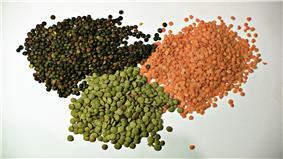 The word dal is also used to name the thick stew prepared from these pulses, an important part of Indian, Nepali, Pakistani, Sri Lankan and Bangladeshi cuisine. It is regularly eaten with rice in southern India, and with both rice and roti (wheat-based flat bread) throughout northern India and Pakistan as well as Bangladesh, East India, and Nepal where Dal Bhat (literally: dhal and rice) is the staple food for much of the population. 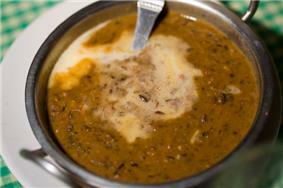 Dal is a ready source of proteins for a balanced diet containing little or no meat. Dhal preparations can be eaten with rice, as well as Indian breads in North India. 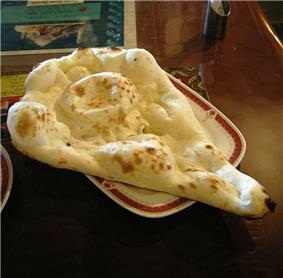 In India, it is eaten with rice and with a wheat flatbread called roti. 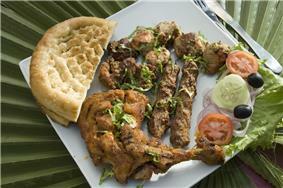 The manner in which it is cooked and presented varies by region. In South India, dhal is primarily used to make the dish called sambar. It is also used to make pappu that is mixed with charu and rice. Dhal has an exceptional nutritional profile after soybean amongst vegetarian foods. Its protein contents are 3.5 times that of rice and 2.5 times that of wheat. It provides an excellent source of protein, particularly for those adopting vegetarian diets or diets which do not contain much meat. It is typically around 25% protein by dry weight, giving it a comparable protein content to meats. However, by weight, cooked (boiled) dal contains 9% protein, 70% water, 20% carbohydrates (includes 8% fiber), 1% fat. Note that as extra water is added to cooked dal, as in the case of Sambar, proportion of proteins and other nutrients will reduce further. Protein contents of cooked Dal are one third that of cooked chicken. Most Dals (except Soybean, being exceptionally higher) have similar amount of protein. Within the vegetarian group, only soybean has complete protein (has constituent amino acids in right proportions). All other dals including Toor Dal do not have individual amino acids within protein in ideal proportion (unlike, eggs and meats). However, if dal is eaten with rice or wheat (roti), it provides amino acids in the right proportions, making it complete protein. (See Protein combining.) Bioavailability of proteins from dals is less than those from eggs and meats. Note: Average daily protein requirements are 55 grams per person. It is also rich in the B vitamins thiamine and folic acid, as well as several minerals, notably iron and zinc. Note that absorption of this iron is reduced by about 65% if tea is consumed immediately after meal. This is important for vegetarians since tea reduces iron absorption from all plant sources including Dal significantly. Iron absorption can be increased by about up to 85% by having vitamin C rich foods such as Guava or Orange juice along with meal. Vitamin C contents of lentils can be increased up to 10.5 times by sprouting. (See sprouting). Toor dhal, i.e. yellow pigeon peas, is available either plain or oily. It is called thuvaram paruppu in Tamil Nadu, "Thuvara Parippu" in Kerala and is the main ingredient for the dish sambar. In Karnataka it is called togari bele and is an important ingredient in bisi bele bath. Toor Dhal is called kandi pappu in Telugu and is used in the preparation of a staple dish pappu charu. It is also known as Arhar dhal. Chana dhal is produced by removing the outer layer of kala chana (black chickpeas) and then splitting the kernel. Although machines can do this, it can also be done at home by soaking the whole chickpeas and removing the loose skins by rubbing. Other varieties of chickpea may also be used, e.g. kabuli dhal. Yellow split peas, are very prevalent in the Indian communities of Fiji Islands, Guyana and Trinidad, and are popular amongst Indians in the United States as well as India. There, it is referred to generically as dhal and is the most popular dhal, although masoor dhal and toor dhal are also used. 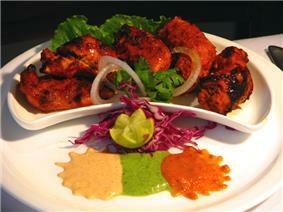 It is prepared similarly to dals found in India, but also may be used in a variety of other recipes. Mung dhal or moong dhal, split mung beans, is by far the most popular in Bangladesh. It is also used in parts of South India, such as in the Tamil dish ven pongal. Roasted and lightly salted or spiced moong dhal is a popular snack in most parts of India. Urad dhal, sometimes referred to as "black gram", is the main ingredient of the Tamil Nadu and Kerala (South Indian states) dishes idli and dosa. It is also one of the main ingredients of East Indian (oriya and Bengali or Assamese) bori, sun-dried dumplings. The Punjabi version is dhal makhani. In Karnataka, it is called uddina bele. It is rich in protein. Masoor dhal is split red lentils. In Karnataka, it is called kempu (red) togari bele. Rajma dhal: split kidney beans. 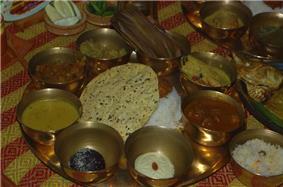 Panchratna dhal ("five jewels") is a mixture of five varieties of dhal, which produces a dish with unique flavour. Various pulses may be split but not hulled; they are distinguished from hulled dhal by adding the word chilka (skin). Although dhal generally refers to split pulses, whole pulses are known as sabit dhal and split pulses as dhuli dhal. The hulling of a pulse is intended to improve digestibility and palatability, but as with milling of whole grains into refined grains, affects the nutrition provided by the dish, reducing dietary fibre content. Pulses with their outer hulls intact are also quite popular in India and Pakistan as the main cuisine. Over 50 different varieties of pulses are known in India and Pakistan. 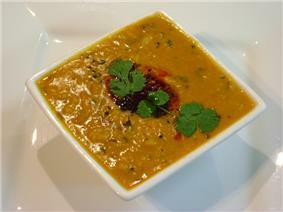 Most dhal recipes are quite simple to prepare. The standard preparation begins with boiling a variety of dhal (or a mix) in water with some turmeric, salt to taste, and then adding a fried garnish at the end of the cooking process. In some recipes, tomatoes, tamarind, unripe mango, or other ingredients are added while cooking the dhal, often to impart a sour flavour. The fried garnish for dhal goes by many names, including chaunk and tadka. The ingredients in the chaunk for each variety of dhal vary by region and individual tastes. The raw spices (more commonly cumin seeds, mustard seeds, asafoetida, and sometimes fenugreek seeds and dried red chili pepper) are first fried for a few seconds in the hot oil on medium/low heat. This is generally followed by ginger, garlic, and onion, which are generally fried for 10 minutes. After the onion turns golden brown, ground spices (turmeric, coriander, red chili powder, garam masala, etc.) are added. The chaunk is then poured over the cooked dhal.